“Not Throwing Away My Shot” could have been the theme at a surprise gathering of juniors and U.S. History students in the auditorium at North High School. “There are times when really awesome things happen in schools, and this is one of those times,” Principal Ben Graeber said to the crowd of hundreds. With that, he announced 150 of the students would be selected to see Hamilton, An American Musical at the Orpheum Theatre in Minneapolis in October. Not only that, they would meet the cast, and record their own work for a chance to perform with the cast during a workshop. The announcement was met with some whoops and cheers. 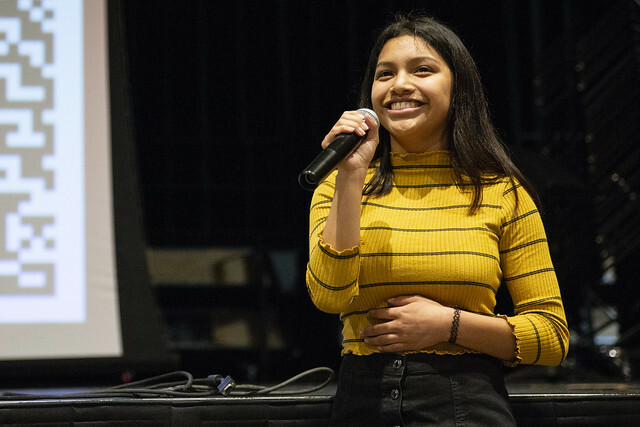 Junior Aline Moreno, who was selected to sing a Hamilton song following the announcement said it was a tough secret to keep, but now that the word is out, she can’t wait to compete for a spot on the bus to Minneapolis. Graeber said NHS Gifted and Talented Consultant Tony Voss and Academic Interventionist Lori Bonnstetter were key advocates for North High School students in securing a meeting with the cast and access to the performance. The two worked with Hamilton, local donors and the Gilder Lehrman Institute of American History to arrange and find funding for the trip. Students will need to complete a class project and turn in a parent/guardian permission form to be considered. If they were selected, the cost to the student would be just $10. The lucky 150 will board four charter buses for Minneapolis before dawn on Oct. 4 to begin what could be a once-in-a-lifetime adventure to learn about American history with a very modern American cast of actors. North High School is still looking for sponsors to help make this trip successful. If you’re interested in helping out, contact Principal Ben Graeber, Lori Bonnstetter or Tony Voss by calling the main office at 515-242-7200.